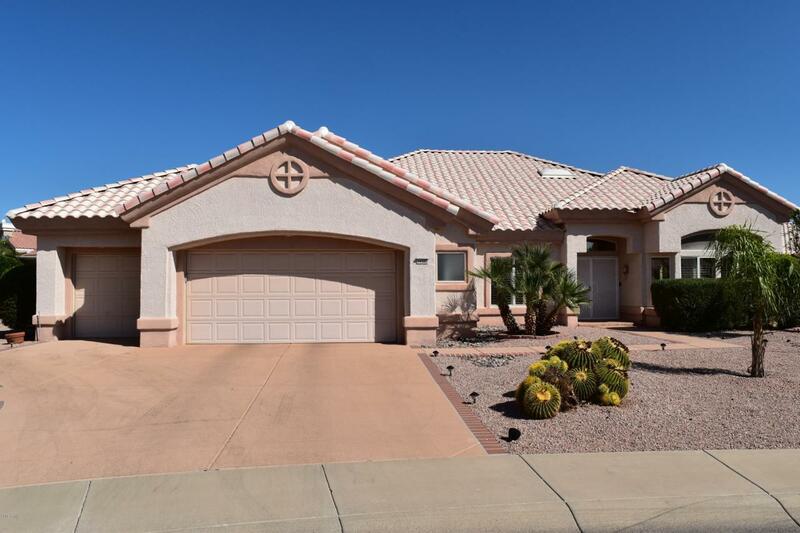 This spectacular 2 1/2 bath 2 bedroom home with 2.5 car garage Cottonwood model Is beautiful throughout. This HOME IS MOVE IN READY. The entire inside of the home has just been painted. Built on the end of a Cul De Sac you have plenty of privacy. There are Shutters through the entire front of the home and a large open floor plan. This model boasts a huge master bedroom and mater bath with a very large walk in closet. The kitchen is a cooks dream with stainless steel appliances(top of the line Whirlpool), some pull out drawers, a large center island and a lot of cabinets. The AC/Furnaces were installed in 2017. The 2 1/2 car garage has Built-in cabinets throughout and a workbench in the golf cart area. The Professionally designed lot boast beautiful fauna and a lot of fruit trees.